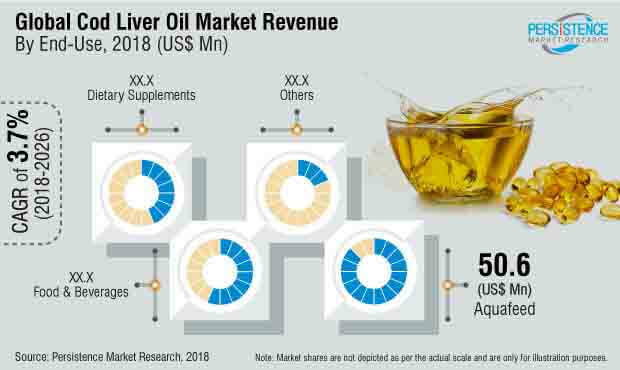 The Persistence Market Research report on the global cod liver oil market analyses the opportunities in the market, and presents updates and insights pertaining to the various segments in the global cod liver oil market over the forecast period 2018–2026. Cod liver oil is considered one of the rich sources of good fatty acids and vitamins. Cod liver oil is gaining worldwide popularity, owing to the omega-3, and vitamin A and D content in it. In the global fish oil market, the demand for cod liver oil is high due to its benefits for mental health and cardiovascular diseases. Cod liver oil has various applications in pharmaceutical and food industries for making nutraceutical and dietary supplements. Cod liver oil is extracted from the liver of cod fish (Gaddus morhua), which are mostly found in the Arctic and Atlantic oceans. In the global cod liver oil market, the demand for cod liver oil majorly comes from Europe and North America. Europe is the world’s largest producer of cod liver oil in the global market. Due to its multiple health benefits, the demand for cod liver oil is increasing in the global fish oil market. It would be anticipated that there would be higher returns for investors in cod liver oil in the future. The increasing demand for nutritious food has led food industries to use fish oil in processed food to increase the nutritional content. Cod liver oil is rich in omega-3 fatty acids such as DHA, EPA, and vitamin A & D, which can be encapsulated using carrier proteins and can be incorporated into the food, and will not affect the flavor and aroma of the food. There has been substantial increase in food supplement consumption among the population. Due to urbanization and busy lifestyles, women consume more dietary supplements than men. In a report published by the Nutritional Diet and Nutrition survey, 33% of adults aged 19-64 years, 22% of young people, and 40% of adults 65 years and older consume dietary supplements to fulfill their nutritional needs. In developing countries, there has been substantial increase in vitamin A deficiency, which provides a better opportunity for companies to introduce cod liver oil as a dietary supplement. They can also encapsulate cod liver oil for the fortification of regional food and beverages, which will ensure the consumption of vitamin A in diets. In developing countries like China and India, urbanization leads to more working women, which leads to the consumption of processed food that has less nutritional content. To fulfill the nutritional content, women consume dietary supplements such as cod liver oil. With the increase in per capita income and more investment in protein rich diets, there has been substantial increase in cod liver oil consumption. The increase in cod liver oil consumption is also due to the prescriptions by doctors. People with low vitamin A and D content are facing several health issues like night blindness and rickets. Doctors prescribe cod liver oil to elevate the symptoms, which will also help in fulfilling their nutritional demand. Doctors also prescribe cod liver oil to pregnant women, which is beneficial in the development of babies. According to a study by Metian and Tacon, in 2006, industrially formulated feeds for crustaceans and farmed fish used 88.5% of fish oil. Cod liver oil can serve as a great source of energy, and the only source of long-chain omega-3 fatty acids, which are essential for aquatic organisms. As most of the fish are not able to synthesize long-chain omega-3 fatty acids in their body, they must consume it in their food. J. R. Carlson Laboratories Inc.
Blueline Foods India Pvt Ltd.